Nassau Beach Club is prepared to offer an atmosphere to both the sun lovers of the day and the cool breeze of the night. The perfect day on the beach by the sea and good music, or a romantic dinner, quieter and under the light of the moon does not matter, both can be enjoyed at Nassau Beach Club. Spending the day at Nassau Beach Club is synonymous with vitality. Refresh your body and your mind lying in one of the magnificent hammocks with a cocktail in your hand, receiving a massage, tasting one of our summer flavored dishes ... or preparing for one of our fresh and elegant sessions of electronic music, which They will dance until the night. 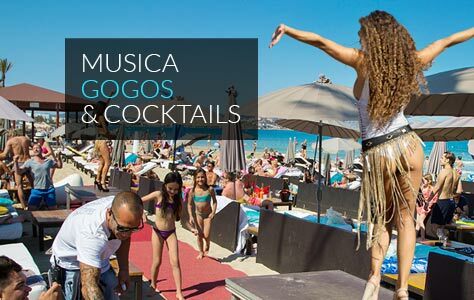 Nassau Beach Club is located at the end of Playa d’en Bossa, not far from the unspoilt countryside around the Torre de Sal Rossa. Its relaxed and cool atmosphere has for the last four years attracted both locals and the international clientele. Nassau Beach Club facilities include a chill-out lounge, a cocktail bar and a restaurant. The interior is elegant and luxurious with posh mirrors, elegant sofas, shell chandeliers, wooden floors and Buddha figures. 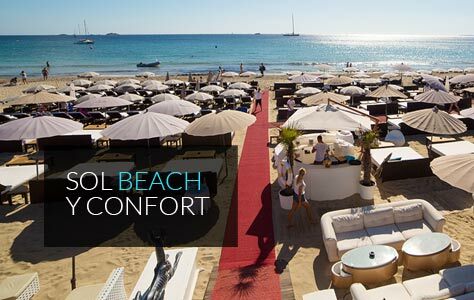 Ibiza A-List Tip: Spend a day on one of the luxury beds and sample the delicious Mediterranean menu.